Archerfish, an award-winning security camera company, invited Swerve to provide a gamut of strategic design services for both Quattro and Solo cameras, culminating in production in China in record time. Swerve saw an opportunity to create a unique structure that would reflect a high-level security system for both Solo and Quattro cameras. The surface of the Archerfish Solo camera inspired a package that would share the same aesthetic DNA and provide a strong, stackable package with a programmed mode of entry. Swerve created a package made of material containing primary and secondary seals that could be broken without scissors, which allowed the item to be put out front in the store. The packaging materials can be easily separated into component materials for recycling. 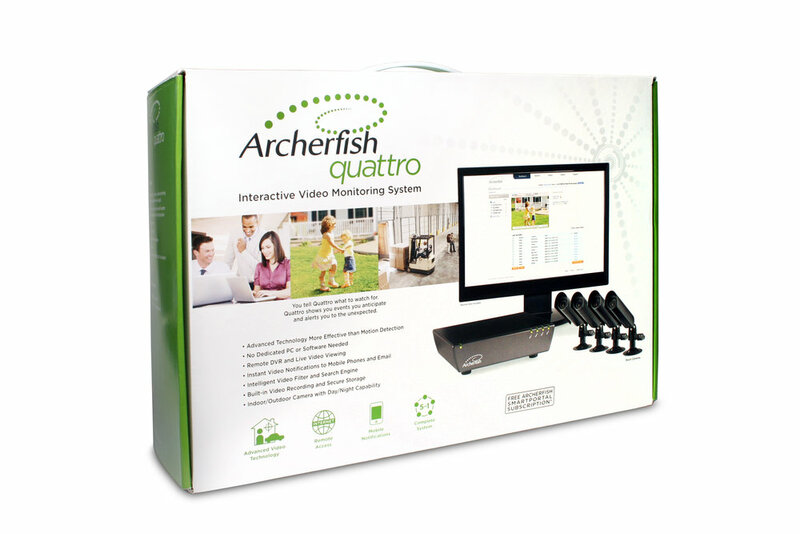 To ensure that the reveal process would reflect the high-level quality of the cameras, Swerve loaded the cameras and cable of the Archerfish Quattro into a “corrugated toolbox” that unveils the cameras and quad processors to the consumer in a neat and orderly way. The out-of-box experience is dialed up with graphic surfaces on each layer that annotate the contents, speeding up the assembly process and reducing the number of 1-800 calls.